The downing of Extortion 17 spurred a number of conspiracy theories, such as the idea that the shootdown was revenge for bin Laden's death. 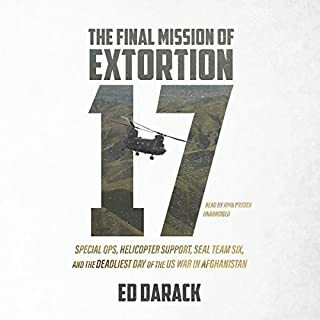 In The Final Mission of Extortion 17, Ed Darack debunks this theory and others and uncovers the truth behind this mysterious tragedy. 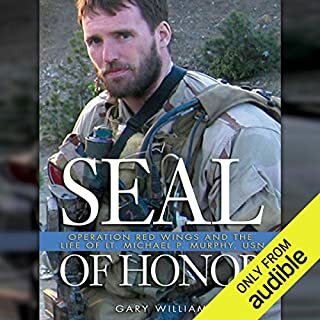 His account of the brave pilots, crew, and passengers of Extortion 17 and the events of that fateful day is interwoven into a rich, complex narrative that also discusses modern joint combat operations and the history of the Afghan war to that date. This is a must read. What I really liked about his book is the description of how our military went after the men who shot down Extortion 17. Within days they were dead. Doesn't pay to mess with the US Military. 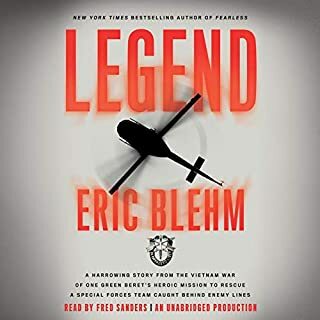 In Legend, acclaimed best-selling author Eric Blehm takes as his canvas the Vietnam War as seen through a single mission that occurred on May 2, 1968. A 12-man Special Forces team had been covertly inserted into a small clearing in the jungles of neutral Cambodia - where US forces were forbidden to operate. Their objective, just miles over the Vietnam border, was to collect evidence that proved the North Vietnamese Army was using the Cambodian sanctuary as a major conduit for supplying troops and materiel to the south via the Ho Chi Minh Trail. One of the best books I've ever read. 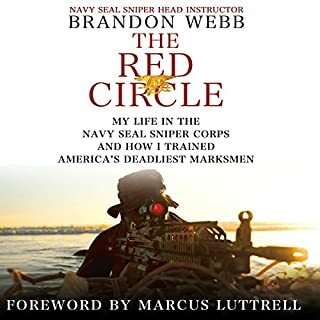 If you could sum up The Red Circle: My Life in the Navy SEAL Sniper Corps and How I Trained America's Deadliest Marksmen in three words, what would they be? This is an excellent book that gives first hand accounts of what life is like in the SEAL Teams. Brandon Webb also includes a personal reflection at the beginning of every chapter which allows the listener to connect with what he/she is about to listen to in each chapter. I highly recommend this book. Excellent job by Brandon Webb detailing his experiences as a US Navy SEAL. 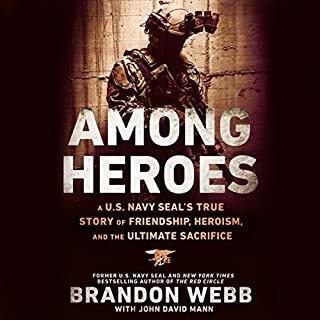 Would you consider the audio edition of Among Heroes: A U.S. Navy SEAL's True Story of Friendship, Heroism, and the Ultimate Sacrifice to be better than the print version? This is my second book that I've read...or listened too by Brandon Webb. The first one was The Red Circle. Among Heroes is a book that goes into details of the lives of Brandon's friends who made the ultimate sacrifice. I applaud Brandon for writing a book like this. All Americans should engage in learning about the men and women who have gone before us in defense of the very freedoms that we often take for granted on a daily basis. A unique characteristic that sets Brandon's audio versions apart from others is Brandon uses his own voice at the beginning of each chapter to give a little bit of his own perspective or an insight of his own perception of what you're about to hear. It's a personal touch that makes the learning experience much more meaningful. I encourage anyone who reads this to buy Brandon's book, Among Heroes and also, The Red Circle. I also encourage you to spread the word about these books. Just as Brandon and his teammates had a duty to serve, we as Americans have a duty to keep the legacies of our fallen heroes alive by spreading the word of their lives. It is our duty as Free Americans. Thank you Brandon for writing these books. I'm already looking forward to your next one. The personal touch that is included in this book by Brandon and others who were family members of the fallen heroes adds a more meaningful purpose to this book. An outstanding feature. Lt. Michael Patrick Murphy, commander of Navy SEAL Team 10, posthumously received the Congressional Medal of Honor for his heroic actions on 28 June 2005 during a fierce battle with Taliban fighters in the remote mountains of eastern Afghanistan. Michael was the first recipient of the nation’s highest military honor as a result of U.S. involvement in Afghanistan. He was also the first naval officer to earn the medal since the Vietnam War, and the first SEAL to be honored posthumously. What did you love best about Seal of Honor? In my opinion Michael's story should be told to all Americans Middle School aged and up. As an educator for 16 years, I firmly believe the leadership and character that was displayed by Murph should be instilled in our youth of today. And as Americans we must never forget the sacrifices of Murph, his men, and others like him who protect our freedoms.